With rainfall of more than 50 inches causing epic flooding in Texas, Hurricane Harvey, which made landfall as a category 4 storm in August, is the worst hurricane to hit the state in more than 50 years. With early estimates of more than $30 billion in damage, the cost and time needed to repair and recover will be unprecedented. Once the devastation is over and clean-up begins, people will be assessing property damage. Residents and businesses in the area may seek near-term assistance from the Federal Emergency Management Agency (FEMA) as well as file an insurance claim with their private insurer to repair property damage. When President Trump signed an order on August 25 declaring it a federal disaster, he made federal assistance available to residents and businesses in that area. By contacting FEMA, individuals may receive grants for a range of assistance, including temporary housing and home repairs and low-cost loans for property repairs not covered by insurance. In addition to filing a claim with an insurance company, property owners need to know that casualty losses — property damage from disasters such as hurricanes and floods — can be deducted on tax filings. Here are some key considerations about casualty losses for taxpayers. These losses are considered itemized deductions on the tax return. Net of any insurance payouts, taxpayers can deduct casualty losses in excess of 10% of their adjusted gross income. 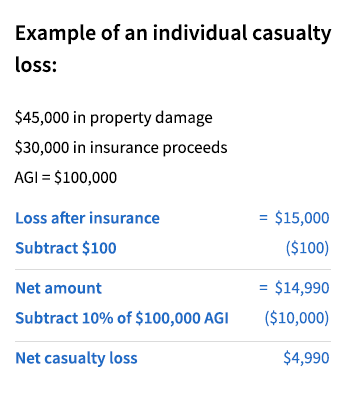 Filers also need to subtract $100 from each casualty loss. (See example). The deduction can be used in the current tax year, or if the area is a federally declared disaster area, taxpayers can deduct a casualty loss on the preceding year’s tax return. Advisors can help homeowners gain an overview of their insurance coverage and connect them with other professionals in their network including tax and legal experts. Filing insurance claims can be complicated, such as condominium ownership where multiple claims could be filed within a complex. Homeowners may also seek guidance on identifying disaster recovery specialists to begin cleanup and repair as soon as possible.